The worship of God, the warmth of the Christian community, and the formation of Godly character, are the things we aspire for in joy and faithfulness. 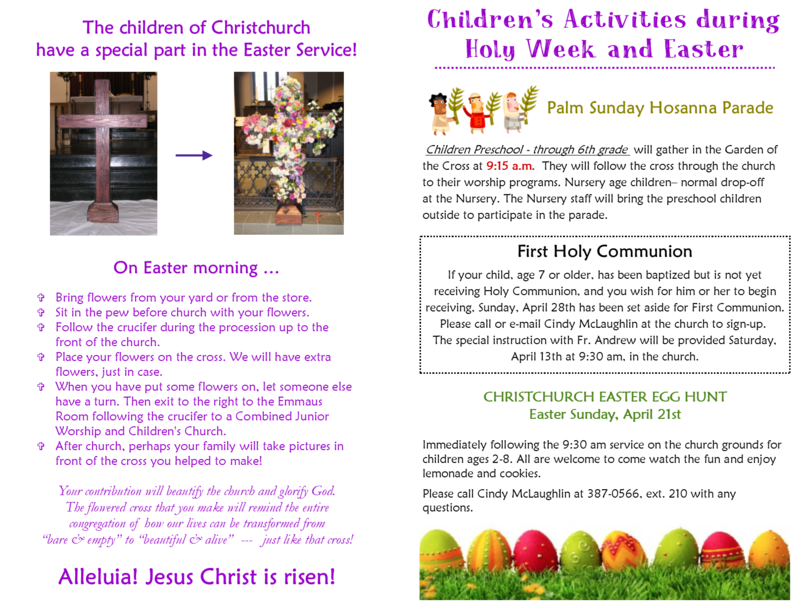 Christchurch is located at 8800 Vaughn Road and we worship every Sunday at 9:30 a.m. We follow this service with a Sunday School hour, with learning opportunities for all ages. We have an active and full parish schedule during the week, including classes and supper on Wednesday nights. We place a high priority on Bible study, on vibrant ministries for youth and children, and on mission, both local and international. If you’re looking for a church that is warm and welcoming, on fire for the Gospel of Christ Jesus, and embraces the beauty and holiness of tradition, we hope you’ll find a home here at Christchurch. And if you do, we trust you’ll find ways to let your gifts and energies bless the work that God is doing among us! We look forward to getting to know you — soon! 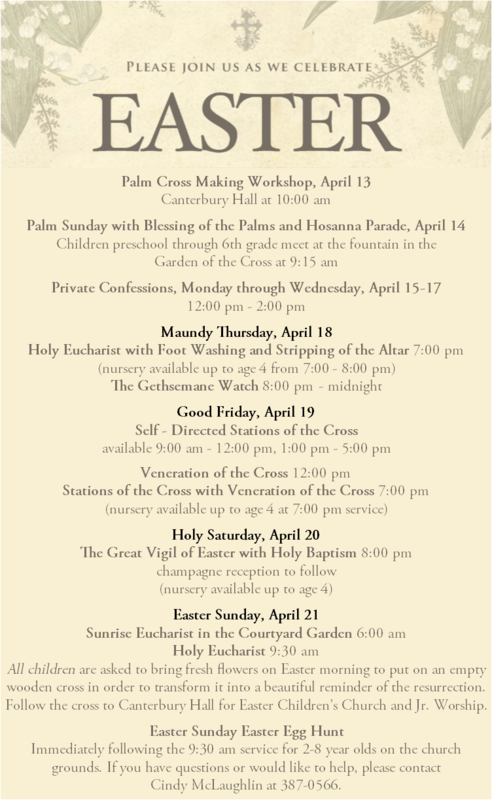 Self-Directed Stations of the Cross: 9:00 a.m. – Noon and 1:00 p.m. – 5:00 p.m.
Stations of the Cross with Veneration of the Cross: 7:00 p.m.
Easter Vigil with Baptisms and Reception: 8:00 p.m.
Easter Egg Hunt: 11:00 a.m.
Church Photo Directory Pictures: Sunday, April 28, 11:15 a.m.